Excerpt from Link Newspaper, July 1986. 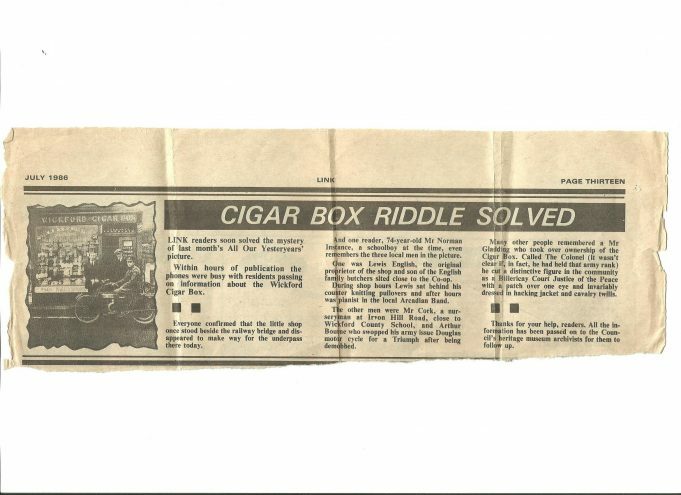 Article from a July 1986 copy of ‘The Link’ following an article ‘All our Yesteryears’ about the Wickford shop the Wickford Cigar Box’. Article does not date the picture but would appear to be circa 1920s. This picture is of a 2.75hp Douglas motorcycle, registered F-6680 in 1914. Arthur Bourne of the Royal Army Medical Corps is said to be in the saddle during WW1, with Lewis English, the original proprietor of this shop, and William Cork a nurseryman in Irvon Hill. I remember the Cigar Box. It was in the railway embankment where the foot-tunnel is going from Aldis up the High Street, opposite Station Avenue. There was a garage too, the left of which got burnt out during the last War, 39/45.